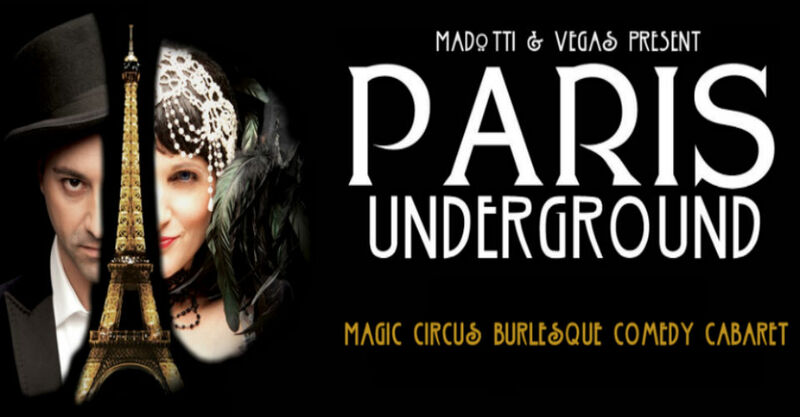 After touring Australia over the past 3 years to sold-out houses and to popular and critical acclaim, The Paris Underground Cabaret comes to South Australia from The 6 Sep until Sun 9 Sep.
A subversion of the classic French cabaret and variety show, this production brings together a diverse range of performers; magicians, dancers, singers, circus and burlesque artists. The show includes the magic of Madotti & Vegas, Australia’s most unique magicians, the beauty and grace of aerialist, dancer and circus artist Hannah Trott; the rare skill of tap-dance king Monsieur Eden Read; the dangerously charming and risqué repartee of chanteuse Aurora Kurth and international burlesque artiste, dancer and showgirl, Mimi Le Noir! Audiences will witness the delights of a magic spectacular and French burlesque, cabaret and variety show,” says co-creator and director of the show Richard Vegas. 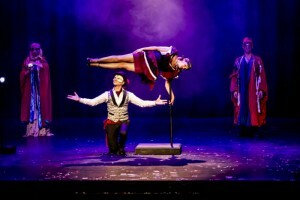 “The singers, dancers, aerial artists and illusionists will seduce and intoxicate the audience with a show that sits as a cross between Moulin Rouge, with a touch of Crazy Horse, high-art circus theatre, comedy and a magic cabaret” he continues.